Get the 2016-17 District Calendar here. Longview ISD has launched a progressive discipline plan. See details here Check out our visitor tracking system for seamless access. Have you downloaded the new Longview ISD app? 'Like' Longview ISD on Facebook and follow Longview ISD on Twitter. Welcome to the Longview Independent School District! Longview ISD is a diverse district with about 8,600 students and some 1,400 staff members. Our richly diverse student population reflects our wonderful city and the East Texas area in general. We are proud to be among the few U.S. districts to offer the esteemed International Baccalaureate Programme. LISD also offers the Montessori program for some of our younger students, and dual college credit courses for our high school students. We are an academically acceptable school district, with one campus, Hudson PEP, receiving Exemplary status for more than 10 consecutive years. In addition to this, Texas Monthly magazine named Hudson PEP as one of the best elementary schools in Texas. Offering the most extensive course selection opportunities in East Texas, Longview High School is the leader in advanced courses. LHS offers more Pre-AP and Advanced Placement courses than other school in the area. The large number of students earning college credit attests to the courses' rigor. An increasing number of National Merit scholars, GLOBE scholars, and Advanced Placement Scholars, and a long-term winning tradition in University Interscholastic League competition offer further evidence of quality curriculum and instruction at LHS. In addition, the successful Academic Decathlon Team confirms the school's emphasis on academics. The Longview ISD Foundation has granted $692,206.92 to education. Note: When you click on any of the following links, you will exit this site. 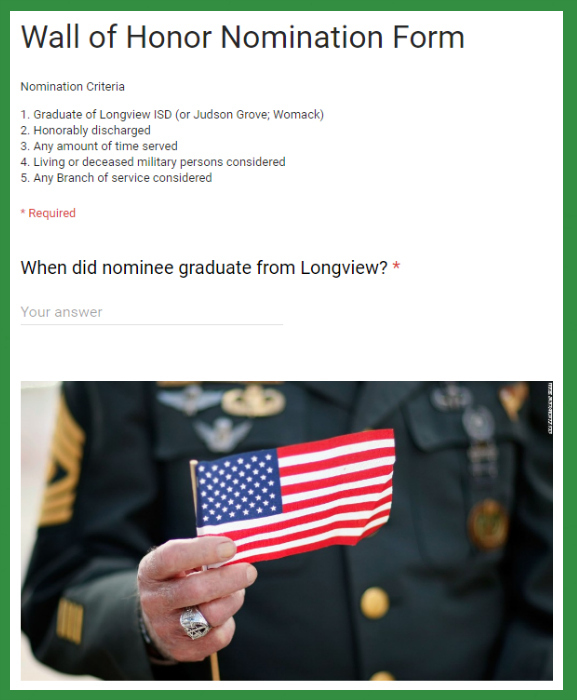 Longview ISD is not responsible for content on non-district sites. Longview ISD is accepting nominations through Tuesday, Sept. 6 for its Wall of Honor. The wall honors graduates of Longview ISD (or Judson or Womack schools) who have been honorably discharged from the military. Andrea Mayo has resigned as the deputy superintendent for Longview ISD, effective June 30, to take a position as Assistant Superintendent of Operations for Duncanville ISD. Parents/guardians of students can pre-register for the School Supply Train from 8:30 a.m. to noon July 11-13. LISD will hold its Pre-Kindergarten and Kindergarten Round Up for the 2016-2017 School Year on from 7:30 a.m. to 4:30 p.m. June 22 at the Student Development Center, 500 N. Third Street, Longview. Football season is still months away, but fans can get a glimpse at next year's team during a variety of offseason events. Longview ISD thanked John Preston during Monday night's regular board meeting, and welcomed newly-elected Place 5 trustee Shandreka "Shan" Bauer. The Longview 2020 Forum has awarded $1,000 scholarships to young men and women who will be starting their collegiate careers in the fall. The Longview ISD Board of Trustees will say goodbye to long-serving board member John Preston, and welcome newly elected Place 5 trustee Shandreka "Shan" Bauer when it meets at 7 p.m. Monday. As the school year winds down and summertime draws near, Longview ISD is hosting various athletic camps to help young Lobos be the best they can be. District still seeking bilingual teachers for 2016-2017! Class of 2016: "WE MADE IT!" Hudson PEP raises $15K for "Jump Rope For Heart"